A rhizome may be broken, shattered at a given spot, but it will start up again on one of its old lines, or on new lines. You can never get rid of ants because they form an animal rhizome that can rebound time and again after most of it has been destroyed… There is a rupture in the rhizome whenever segmentary lines explode into a line of flight, but the line of flight is part of the rhizome. That is why one can never posit a dualism or a dichotomy, even in the rudimentary form of the good and the bad. You may make a rupture, draw a line of flight, yet there still is a danger that you will stratify again everything, from Oedipal resurgences to fascist concretions. Groups and individuals contain microfascisms just waiting to crystallize. Yes, couch grass is also a rhizome. Edited by Sylvere Lotringer, On the Line was the first book published in the new “Foreign Agents” series in 1983. 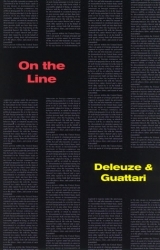 It gathers together two seminal texts that Deleuze and Guattari would later elaborate on in A Thousand Plateaus. First delivered in French by Deleuze (drawing graphs on the blackboard) at the “Schizo-Culture” conference organized by Semiotext(e) at Columbia University in 1975, “Rhizome” introduced a new kind of thinking in philosophy, both non-dialectical and non-hierarchical. The two didn’t expect this neo-anarchical blue-print would eventually offer an early template for the understanding of the internet. “Rhizome” substitutes pragmatic, “couch grass,” free-floating logic to the binary, oppositional, and exclusive model of the tree. In “Politics,” superceding the Marxist concept of class, Deleuze envisages the social macrocosm as a series of lines, and reinvent politics as a process of flux whose outcome will always be unpredictable. It is, he emphasizes, the end of the idea of revolution, but not of the “becoming revolutionary.” Throughout, he keeps dispelling the notion of capitalism as a repressive machine only meant to extract surplus value from exploited workers and suggest that it could be opposed from within by redirecting the creativity and multiplicity of its flows. The multiple must be made, not always by adding another dimension, rather in the simplest way, by dint of sobriety… A rhizome as subterranean stem is absolutely different from roots and radices. Bulbs and tubers are rhizomes… Even some animals are, in their pack forms. Rats are rhizomes. Burrows are too, in all their function of shelter, supply, movement, evasion and breakout… The rhizome includes the best and the worst: potato and couch grass. Gilles Deleuze (1925-1995) was Professor of Philosophy at the University of Paris VIII, Vincennes/Saint Denis. He published 25 books, including five in collaboration with Félix Guattari. Félix Guattari (1930-1992), post-’68 French psychoanalyst and philosopher, is the author of Anti-Oedipus (with Gilles Deleuze), and a number of books published by Semiotext(e), including The Anti-Oedipus Papers, and Molecular Revolution in Brazil (with Suely Rolnik).